With back-end API's and an enterprise-ready web front end, OneSky's UTM system joins UAS flight plans with safety-of-flight services. Highlighted by an interactive 3D interface, users have the ability to submit flight plans representative of single-point volumes (point-flight) as well as more detailed waypoint-defined flight paths (path-flight) and are able to check their flights against an expanding set of flight-safety analytics such as GPS Health Prediction, Airspace Intersection & Proximity, Terrain Considerations, and more. OneSky UTM supports realtime operation monitoring as well as analytical notification/alerting engines for enhanced situational awareness during flight. Easily keep track of operations and receive advanced notifications and warnings when changes present safety concerns. 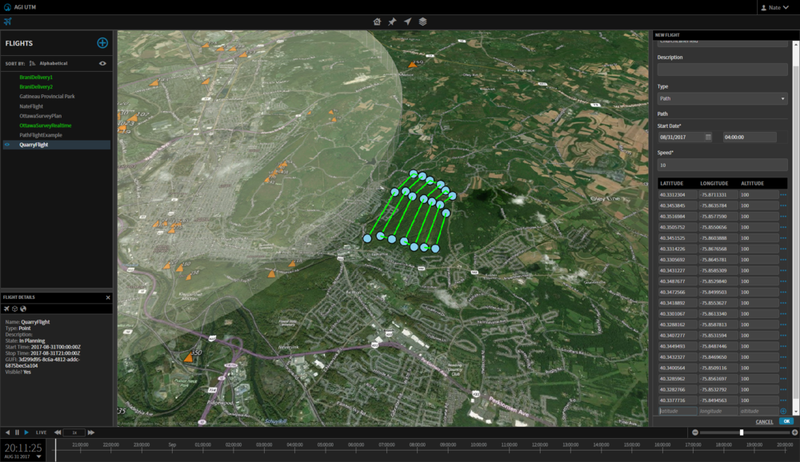 Users can customize their interface by introducing their own data layers and mapping elements, adjust various visualization options, and define how the overall system should present analytics such as thresholds for airspace proximity warnings for example. The system will remember your preferences so you are always ready to model, analyze, and monitor your operations. Take a closer look at OneSky's UTM web portal. See how simple it is to submit flight plans, explore various safety of flight analytics, and bring realtime monitoring to a whole new level! OneSky's UTM Framework was used for Singapore's conceptual urban unmanned traffic management demonstration at this year's Singapore Air Show. This was part of a collaboration with Singapore's Air Traffic Management Research Institute (ATMRI), Civil Aviation Authority of Singapore (CAAS), and Nova Systems to highlight various aspects of introducing UAS into Singapore's dense urban environment safely and efficiently. Start using the UTM system today! start exploring the OneSky UTM portal. Check out the OneSky UTM System Getting Started materials and start using the web interface today to create flight plans and explore advanced flight-safety analytics.